One of the big changes in X Rebirth when compared to the old X games is that you as a player will only be flying a single ship. But before you get upset and complain about the lack of freedom to steer other ships, WAIT... that's still possible. Its just packaged in a different way... So please be patient for a moment and read on. Like in X:Beyond the Frontier, where the player was also bound to a single ship called the Xperimental shuttle, X Rebirth will place you in another very special ship: The Pride of Albion, or as it is more recently known: The Albion Skunk. This one ship, however, is not just another ship like those you know from our past games. For starters, it has several rooms that you can see and use, it has a crew of NPCs who work for you, their captain, and who you can meet face to face. Some of these NPCs can be hired and exchanged, others you meet by destiny (or as we refer to it: The plot). The best example of that latter kind will be your co-pilot. She will be your interface to the ship and helps you control many of the more complex aspects of the game. It has a long history and that history is far from over. You can influence what this ship is and how it develops. It is a fast and maneuverable ship and can be expanded. Weapons systems, engines, shields, but most importantly: Drones. 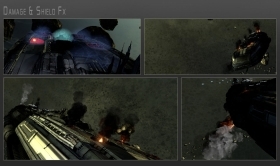 Drones are a very big new area of the game and are used in many different ways by YOU the player. Torpedo drone: Drones are used for a wide variety of special tasks. First of all there is the possibility to remotely control a drone. This is basically exactly like switching personally into another ship. You can fly drones in a 1st person perspective and it looks as if you are inside the drone. You do this, however, using a Virtual Reality environment in your ship. While your co-pilot takes over the control of your ship, goggles come down from the ceiling and you dive into the remote control of the drone. The cool thing about this, is that with drones we have even more design freedom than with ships. They can be very small, for example, and are generally very specialized for a particular job. 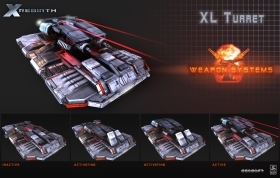 The whole gameplay experience can be a lot more varied than with normal ships, which always have to contain a lot more features. 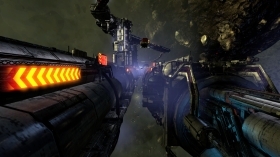 AI: Improved flight AI allows ships inside complex station geometry. This is also one of several gameplay changes that allow us to get the player deeper into station and ship environments and help you play with the elements at the surface of ships and stations. A drone can sometimes reach into vents and corridors that are so small that even your ship cant fit inside. Last but not least, another nice side effect is that you won't die if you are shot down inside a drone. All that happens is that you lose a vehicle - one of many that can be launched from your ship. Drones can also help you in a fully automatic mode. They have an AI and can work autonomously if you launch them. This can give you assistance for especially hard jobs. Drones can act autonomously or can be controlled via the virtual reality remote control system of your ship. Where the drones are your preferred vehicles for specialized tasks inside and near the surface of a station, capital ships are your vehicle of choice for all the many "big" tasks. From transportation of goods, collecting of resources like ore, gas or plasma up to large carriers and destroyers. 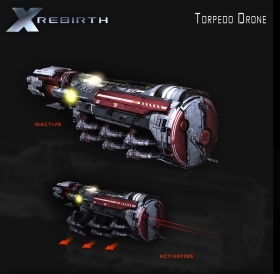 They all exist in X Rebirth and you can of course own and operate many of them! You can in fact even land on these beasts and get out of your playership to meet NPCs while watching the large ship move around in space FROM the deck of the ship! You won't be sitting in the cockpit and steer such a capital ship from the first person perspective anymore simply because that is boring. Steering huge and slowly-turning ships manually just doesnt make sense. It would force us to make them turn and move unrealistically quick and even then they would be impossible to maneuver near our huge and complex shaped stations. Instead the steering is done by NPCs who work for you but closely follow your orders. You can control capital ships who work for you in many new ways. Capital ships as well as space stations are now a lot more detailed. These details, however, are not limited to improved and animated visuals. They are there for gameplay reasons. A single capital ship can have hundreds of objects on its surface. 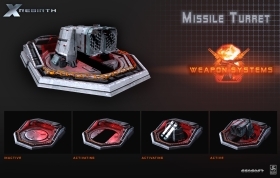 Things like turrets and shield generators which can of course be scanned, manipulated or simply destroyed individually, but also bigger objects like jumpdrive generators, engines and much more. 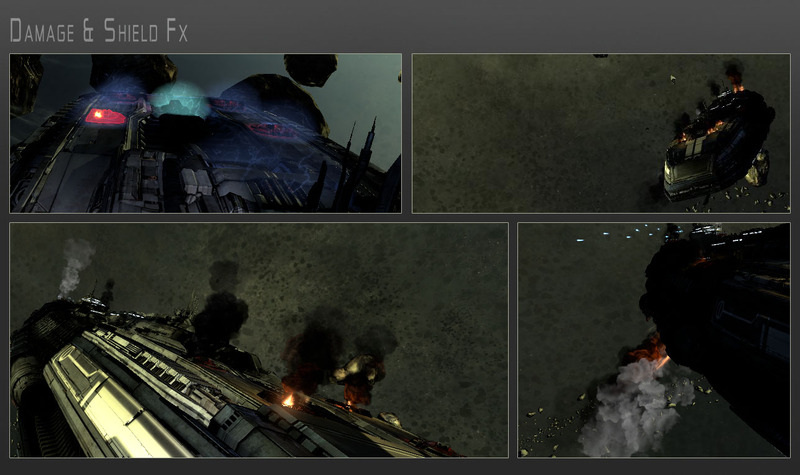 Ships and stations can be attacked and analyzed in great detail. Some systems are partially destroyed. Surface elements: Various types of turrets can be built in large quantities on stations and ships. Important key modules can be protected by many turrets and shield generators. What system should be disabled first to get the best possible outcome from an attack? What systems should be sabotaged instead of destroyed? Whats the benefit of an espionage mission to scan the surface of a ship or station? Which defense systems should you personally take out to help your capital ship to more effectively use its own weapons? But it's not just useful for fighting. On the contrary: The biggest changes are on the building, trading and designing of your own stations and ships. Stations as well as ships are no longer things that you build or use as one large object. They are systems that are developed and improved. Read more about this in the building section. Here is another of these big gameplay changes we had to do: When flying closer to large ships, your ship (or the drone you are remote controlling), will gradually be drawn into the influence of that ship. The closer you are to its surface, the more the ship will "drag you with it". This allows you to actually land on or in ships while they are moving. Even in the middle of a fight between two capital ships you can fly over the surface of one and watch the scenario of the battle like a passenger with the beautiful space background turning around you, while the capital ships move and turn. I have already mentioned the NPCs who help you operate your ships (all of them). This is another of these BIG things for us. We want to make the game easier to understand by controlling many of the complex things you can do in an X game through conversations. Instead of dry and hard-to-interpret text menus, you will be talking to people. You will give them commands and they willl tell you about their progress - all in the form of conversations. Managers onboard your factories run the economy side. They buy and sell wares, but will only do what you allow them to do. Captain of a ship: He or she is the person on the bridge who steers the ship according to your commands. You can tell them what you want them to do in very fine detail, or you give them more freedom or assign them to work for a station manager. Your Co-Pilot: She was already mentioned above and she is the most important of all NPCs in this game. You will learn more about her soon. Boarding crew: Just one example of crew members working for you.